Today we learned that Ned, a castrated bull elephant seized by federal agencies earlier this year, died peacefully at The Elephant Sanctuary in Tennessee. Ned's sad life as a captive born bull elephant performing in a circus, is a poignant reminder of the grim life and early death that is the legacy of most captive bull elephants. We are all grateful to The Elephant Sanctuary for the dedicated care which Ned received during his brief time of peace and freedom. 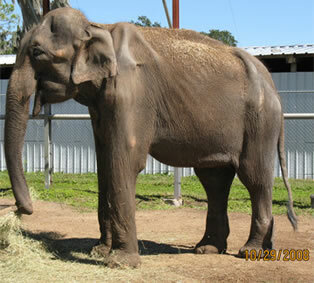 Please join us in Ned's name to end the use of elephants in circuses and traveling shows.